Prince of Peace is a partner with the Haitian Timoun Foundation (www.htflive.com). The mission of HTF is to work towards hope and sustainability with dignity for the people of Haiti. Through innovative approaches, by hard work and dedication, and with staying power, our partners and the HTF network is a family united by unbreakable solidarity. Every year a group of people from Prince of Peace travel to Haiti to meet with our partners in ministry and build relationships. We don’t go to ‘fix or solve’ any problem, we go to learn about the Haitian culture and to invest in relationships with Haitians who are transforming Haiti. 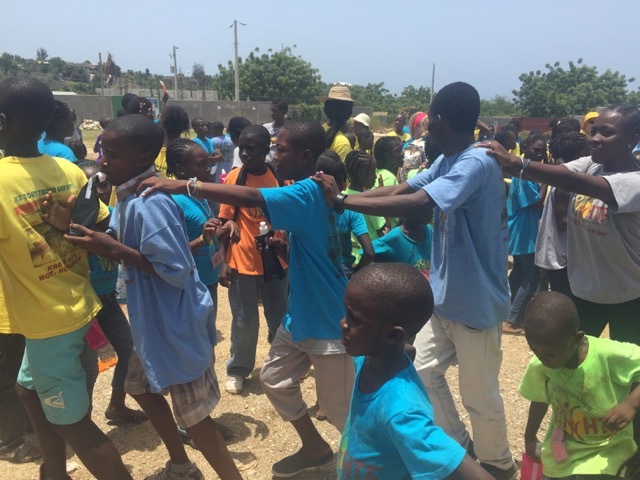 Every summer a group of young adults travels to Jacmel, Haiti to help lead a summer camp for hundreds of children. Summer camp is a fun, transformative, and powerful week filled with lots of laughter, music, and joy! Prince of Peace is also committed to supporting HTF’s partners through financial gifts, prayers, and standing in solidarity with with the men, women, and children of Haiti.